It Took A Musician's Ear To Decode The Complex Song In Whale Calls Male humpback whales create "songs" together, scientists say. Katy Payne was the first to hear the shifts in pitch and pattern in the collective calls as complex music — haunting, evolving tunes. Humpback whale and calf, off the Revillagigedo Islands, Mexico. 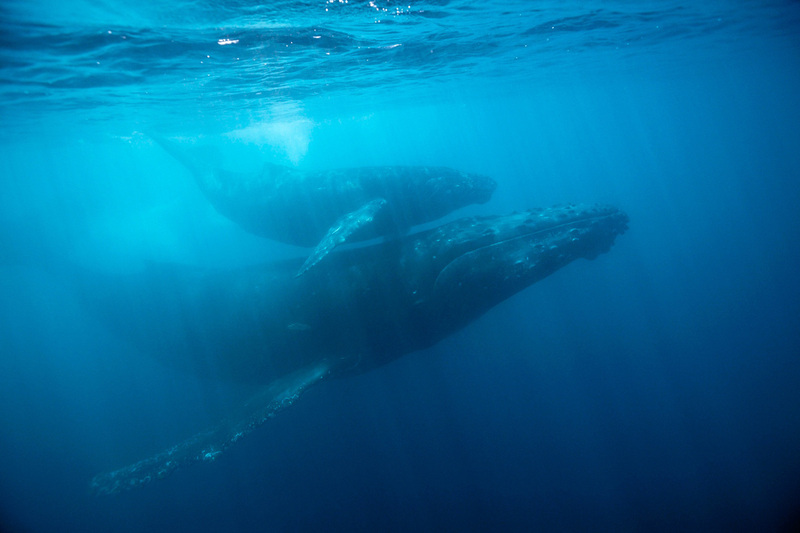 Humpback whales don't just sing songs — they compose with the whales around them, singing a song that evolves over time. Scientists didn't know that until they started recording whale sounds in the 1960s and spent years listening. The evolution of this "culture of listening" among researchers is the focus of Morning Edition's weekly summer series, Close Listening: Decoding Nature Through Sound. "It's the voice of a male humpback whale off shore of Bermuda, in 1964," Katy explained. "It was recorded by a Navy engineer." The Paynes met the engineer, Frank Watlington, on a trip to Bermuda. A friend of theirs had recommended they look him up because he shared their passion for whales, and Watlington invited the Paynes aboard his ship. "We had no idea we were going to hear anything," Payne told us. "He said, 'I don't suppose you've ever heard the sounds these animals make?' "
And then he played the song of the humpback whale for them. "I had never heard anything like it," Katy said. "Oh, my God, tears flowed from our cheeks. We were just completely transfixed and amazed because the sounds are so beautiful, so powerful — so variable. They were, as we learned later, the sounds of just one animal. Just one animal." Watlington had picked up the whale's call while doing some recording with underwater microphones — hydrophones — for his work. In those days, the Navy used such equipment to listen for enemy submarines. "I don't think anybody knew what he was picking up, and he kept it a secret," Katy recalled. Watlington was afraid whalers would use the songs to find and kill the humpbacks. Before they left, he gave the Paynes the recordings and told them, "Go save the whales." The recordings were a revelation to most scientists. And there was something peculiar about the calls that the Paynes didn't recognize at first. It took Katy's special skill and training to discover it. 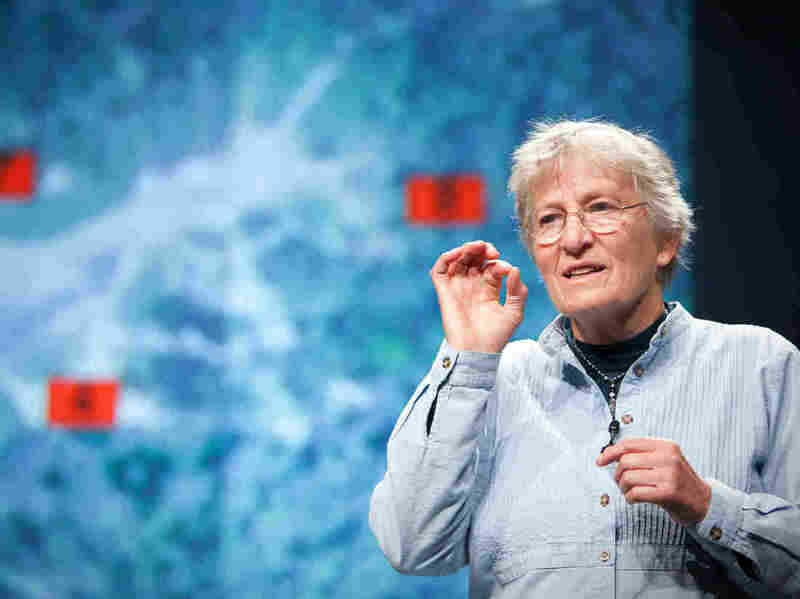 Biologist Katy Payne in October 2009. Once she saw spectograms of humpback whale calls, she says, she began to notice their musical structure — what looked like melodies and rhythms. "I majored in music, with biology as a secondary," she explained. "But I was sort of my own person, really. I was always, always watching and listening to animals." The Paynes took the tapes home. Katy was taking care of their four young children at the time, but when she could find a moment, she would listen and lose herself in another world. On our visit with Katy at Cornell, we played several of these haunting humpback songs from the Cornell Lab of Ornithology archives, and asked her to help us understand what we were hearing. "We call this the beginning sound," she said of the first passage of notes in one song. "Do you hear echoes?" she asked us. "From the bottom of the sea, the underside of the waves? [With] every sound, all the whales are listening. They have memorized this song." The first time she heard such calls, Katy wanted to see the sounds, to see if there was a discernible pattern. So she got spectrograms of them — visual representations that showed peaks and valleys and gaps. As she traced them with pencil and paper, she began to see structure — what looked like melodies and rhythms. "This is a crazy sort of arrhythmic portion of the sound," she said of one passage. "But it's coming into another rhythmic portion that goes up in pitch." The pattern's not random, Payne explained, and that's key. Lots of animals have calls or vocalizations. But the humpback whales' long, intricate songs change — they evolve. It's exclusively the male humpbacks that sing, the Paynes now know, and at any moment in time, all the males in a local group sing the song in roughly the same way. But over time, some parts of a group's song gradually change, too — in rhythm, pitch and duration — as the whales listen to each other, and together take up variations that eventually become a new tune. Payne has actually memorized many such songs, and can sing them note for note. Here's a comparison of just single phrases in different years. You'll hear Katy first, then the whale just behind her. Why do these male humpbacks gradually modify their songs? "We don't know," Katy said. "Ask the whale. But we can say that it seems to be attractive to be an inventive male. Perhaps it's what we call sexual selection. The female is selecting the innovative male." It's sort of like jazz, she said, where each player riffs on the same methodical repetition, but innovates too. At first, other biologists didn't believe whales collectively composed new songs. Even Payne's husband was skeptical. So the Paynes got their own hydrophones and boats. They went back to Bermuda, and then to Hawaii and South America, spending years recording whales. Ultimately, their analysis of these vocalizations showed scientists a way to illuminate life in the deep ocean — not with a flashlight, but with the ear. And many young scientists followed the Paynes' lead, studying other species. One of those scientists was Christopher Clark, who joined the Paynes in Patagonia, Argentina, in 1972, to help record the calls of southern right whales. "You'd sit there listening to whales blowing," Clark told us, "and to the [elephant seals] snorting on the beach." At night, the Paynes made their own music on a violin and a cello. "We gave Chris a guitar," Katy recalled. "It was a free and playful time. God, it was wonderful." "I learned to play under the Southern Cross," Clark said. He was hooked. And soon he would hear things in the ocean that even the Paynes never imagined. Bill McQuay is an audio producer at the Cornell Lab of Ornithology. He's on Twitter: @mcquay_bill. Alison Richards, NPR's senior editor for science, is the series' editor.